Heartfelt Balance Handmade Life: Happy Saturday! Braces, Band Concerts & Leaning Trees. 'Tis the Season! Happy Saturday! Braces, Band Concerts & Leaning Trees. 'Tis the Season! 'Tis the Season for all things Christmas, including band concerts and Christmas Trees. Not sure how the braces fit into the season, except that it's just how the timing fell. You think maybe we could have chosen a less busy season to FINALLY get my son's braces on!?!? BRACES at Christmas??? Oh My! Actually, I know how getting the braces fell this way. We originally went to the orthodontist in June so that we could start the process over the Summer. Even the timing then was weird with vacations and going home. My hubby wanted to get a second opinion though. And by the time we finally got around to (meaning by the time I finally got around to finding another orthodontist~~why does it have to be so hard to make a decision???) it was November. We got our second opinion and went back to the first orthodontist. We loved the second orthodontist, but even with insurance she ended up being twice as much, and that just wasn't going to happen. Why did my hubby want a second opinion? Because one of the options with the first guy was to have 4 teeth pulled, have the braces on and then have surgery on his jaw when he turned 18. Neither of us were keen on having them break his jaw. But my hubby heard that option and it stuck in his mind and he couldn't get past it. Apparently, his lower jaw is underformed, which is what causes his overbite, if we're understanding correctly. I believe he got that whole situation from me. I also had an overbite that they tried to correct by moving my jaw forward when I had braces, and I'm currently having issues with sleep apnea that seems like it could be caused by part of the same issue. The second option was to have 2 teeth removed, have braces, and the finish wouldn't be "perfect." We chose that option. I figured I've been living with (more than likely) the same issues my whole life and I'm getting along fine~~except for the sleep apnea thing~~that may or may not be related. As of right now, he got his top braces on yesterday, without the wires. The wire will be put in once he has the two teeth removed. We have the appointment with the oral surgeon next week and then we'll schedule the teeth extraction after that. So, hopefully by January he'll have the teeth in motion. I feel so blessed to be in a community where we actually still have music programs. There are a lot of people who aren't happy that music classes are forced on us, but the school system really does a good job. The kids are required to take a music class (either band or choir) for the first three years of middle school ~~ 5th, 6th & 7th grade. We have to pay for our own instruments, which can be expensive, especially if you have more than one kid, and I guess the kids who can't afford it, do choir. The experience of the kids learning how to play music has been priceless though. My son plays two instruments now. He plays the trombone, which he would have gotten first chair for in his class. BUT, he tried out for Baritone and made it, so now in his regular band class he plays the Baritone. He tried out for jazz band last year, and is in the jazz band now, and still plays the trombone in that. So, between his jazz band concerts, his regular 7th grade concerts and NOW, my daughter's 5th grade band concerts, we have 10 concerts that we get to attend this year. 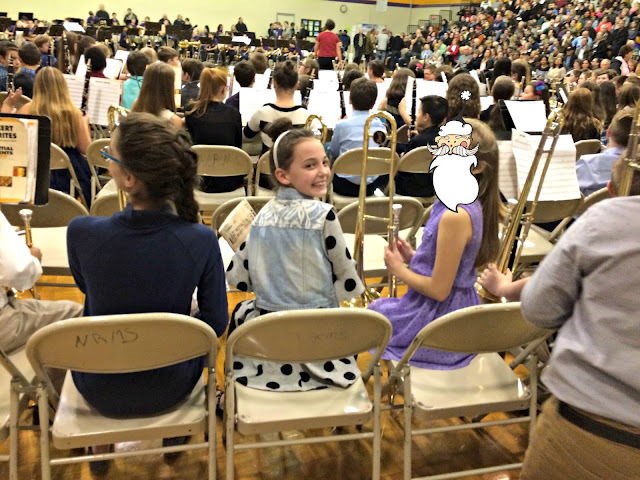 This past week, my kids were in their first band concert together. The 5th grade band and the jazz bands were playing in the same concert. I think my daughter wanted to play trombone because her big brother plays the trombone. To hear her tell the story she said that HE TOLD HER to play the trombone. Haha. Whatever the reason, I was excited that she was playing the trombone also. The kids only have four choices of instrument in 5th grade~~trombone, trumpet, clarinet, or flute. At the end of 4th grade, they try out each of the 4 instruments and the music teacher looks at their talent for each instrument. The child is allowed to put down their 1st and 2nd choice, but the band teacher recommends which instrument they would be good at, and hopefully they meet somewhere in the middle. My son originally wanted flute or trumpet, but they recommended trombone. That's a good thing, because he really turned out to be a natural trombone player. I will truly be sad if he gives up the trombone to do only the Baritone! For now though, he's gonna have to learn how to play both with his new braces! 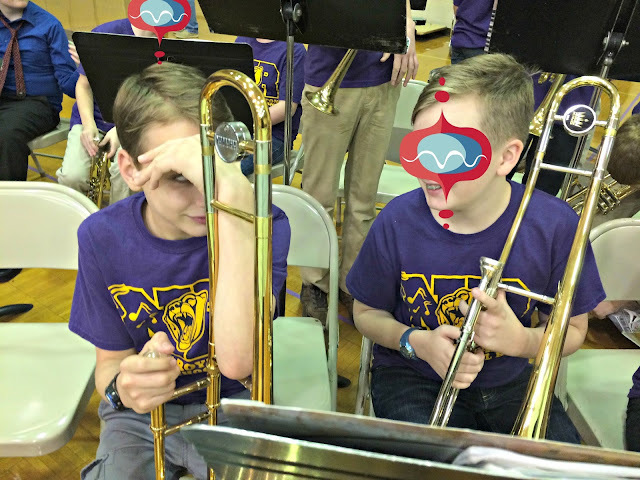 He has several friends who play the trombone with braces, so it will be okay. 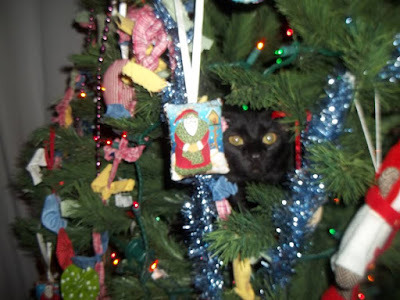 I believe it was the 2nd year that we had the cat that the tree finally went all the way down. The entire stand broke. We kept that tree though and last year my hubby built a new stand for it. One year we bought a live tree, but decided that we'd probably never do that again. I guess we chose the wrong live tree, because my hubby was not impressed at all! Instead, we just try to burn oils or candles that smell like evergreen trees. For some reason, I feel like celebrating Christmas more than usual this year. I've been watching the Hallmark channel all the time with their Christmas movies. We got the leaning tree up a few days earlier than usual. We've already made one batch of Christmas cookies. And one final thing. . . . my Dad turns 70 today! Happy Birthday to him. I can't be with him on his birthday, but I got to talk to him and he's always in my heart. He is still completely active, and is currently redoing the inside of his house. When I talked to him this morning, he had to go home and work on finishing up baseboards & such. 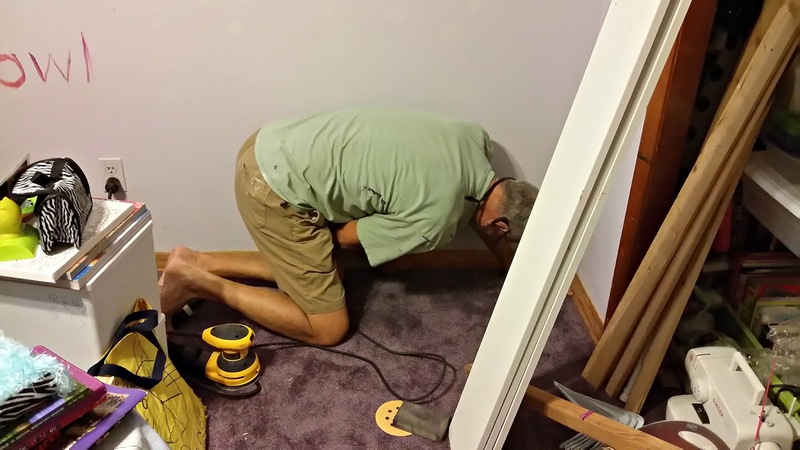 In the past month, they've ripped out the floor in their dining room, knocked off the popcorn ceiling in their house, which includes a vaulted ceiling, replaced all of their ceiling fans, sanded, primed, and repainted door frames, and now he is replacing base boards. The man stays busy. He has also been helping my brother with stuff at his house, I guess. I hope to be as active as he is when I turn 70! Over the Summer he helped us re-do my daughter's room. He had to fill in all of the thousands of holes in her wall, and paint and he sanded and re-painted all the trimwork in the room. 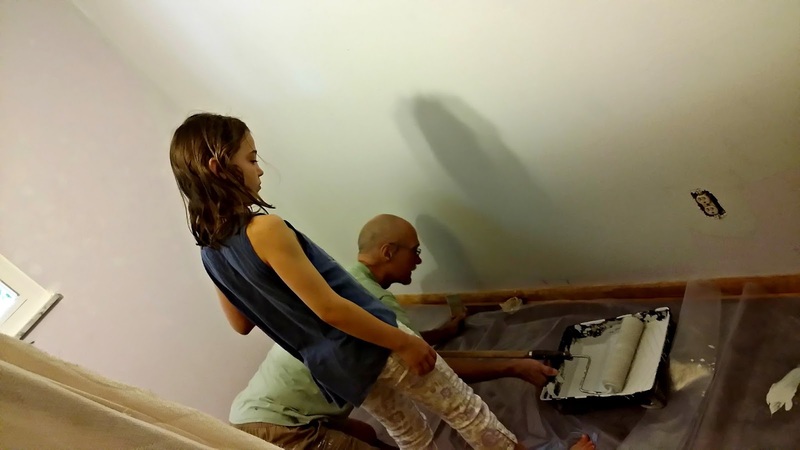 Then he repainted her dresser and shelves and helped her hang some stuff. How did your last week go? Got anything Christmas-y going on yet? All I could think when I read this was "Holy Crap! 16 birthdays." You definitely have me beat in the "busy" category! LOL Hope you have a great holiday! My son has his braces and it has been a process, teeth removed, then the spaces had to fill in and now we see the light maybe 4-6 months away. Happy 70th to your dad enjoy him. I'm sure your son is happy that he's only 4 - 6 months away! Thank you for your birthday wishes! Sounds like you've had a busy December. It's good that you guys asked for a second opinion, our kids definitely deserve the best options! Yes, second opinions are usually a good idea! Thankfully, the extremely busy part is over now & I survived! Hope you have a great New Year! 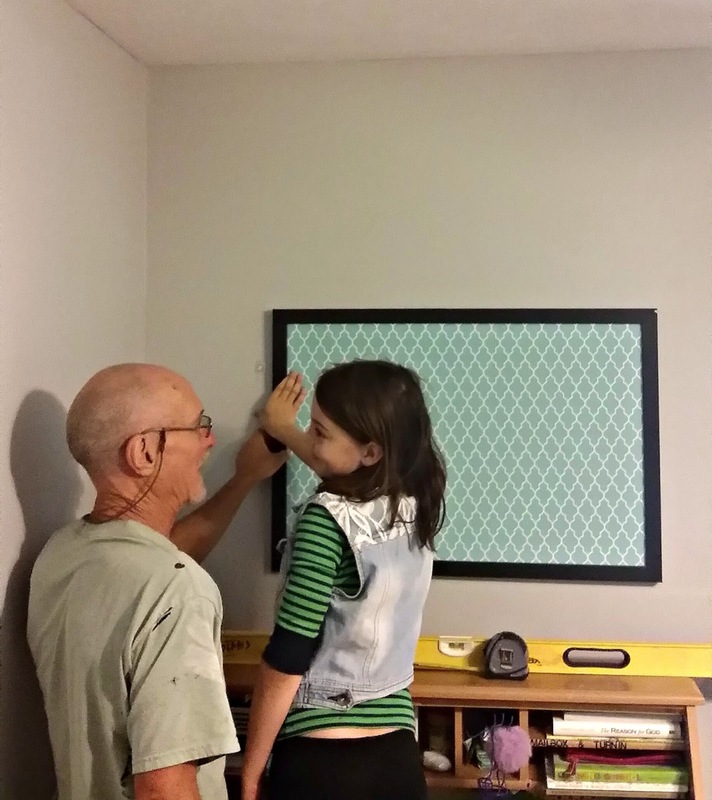 What a great Grandpa! Happy Birthday to him. 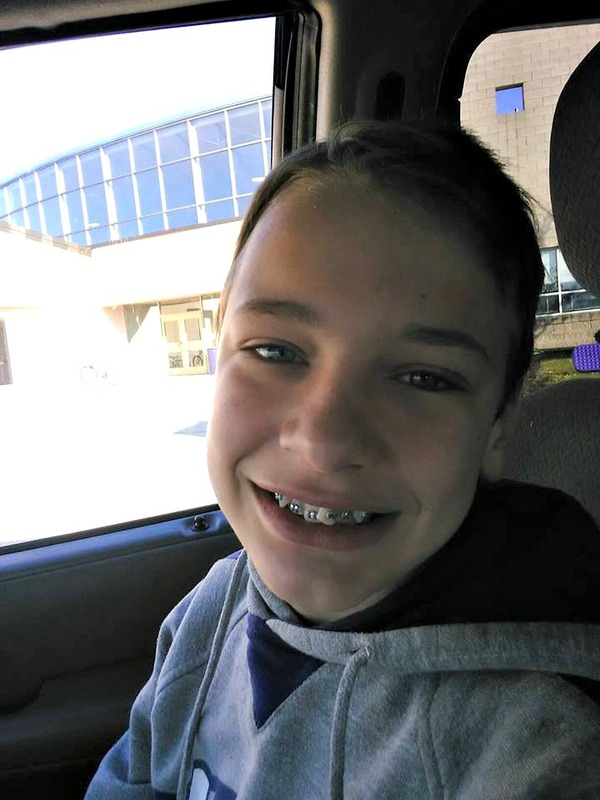 As for your son with the braces and surgery- I seriously cringed when I read the first Orthodontist's plan to break his jaw, etc... I can understand why your husband wanted a second opinion. I'm glad you're halfway towards fixing the issue though- and without him having to have his jaw broken! Yes. We decided on the non-jaw-breaking option. Supposedly his bite will never be perfect without that option, but I think it will be good enough! Thanks for your birthday wishes for my dad! Wowza that's a crazy December schedule! 16 birthdays?!? Love that the kids are in music class. I wish my parents would have been a bit more diligent in signing me up for lessons when I was a child. Yes, I love that they have the music classes. I think it's important and I wish I would have stuck with some kind of instrument! It's never too late to learn, Serena! Maybe you should put that down as something to do in 2018!!! My little sister had braces and her teeth look so good. Its a lot for them but worth it. I bet your daughter loves having her braces off and her new straight teeth! My daughter just got her braces a few months ago (right before Halloween)! She actually loves them a lot more than I thought she would, but I think it's because she's excited about her teeth being straight in the end. That's awesome that she's excited about it! Straight teeth are definitely a good thing to be excited about. I would do it again in a heartbeat to have straight teeth again. But, I need to pay for my kids first! Ah band concerts. My dad was an orthodontist so he would only let us play the trumpet or the trombone. I was so annoyed because I wanted to play the drums, then the sax, but not the trumpet. Needless to say my sister and I gave up the band for being a majorette after a few years. Our teeth still look amazing, but I'm not sure if we could still twirl like we used to. So lucky having an orthodontist dad! I bet it was fun to be a majorette. Someone just asked me recently if they still had majorettes nowadays and I told them I had no idea! You should pick up a baton soon and find out if you can still do it! You are definitely a busy lady! Last week my oldest son had his Winter concert and bake sale, and I did some Christmas shopping. I'm nowhere near being done though lol I waited way too long to start this year. I was still doing stuff last week, right before Christmas, so I understand! Hope you had a great Christmas! Sounds like you had quite a busy time. I've never been into bands that much but I listen to some I guess. Your grandpa sounds amazing, happy birthday to him. It's a funny thing. . . when your kids are in the band, you all of a sudden love bands. ;) LOL My dad is a pretty amazing guy. Thanks for the birthday wishes! It definitely gets a little crazy out there the closer it gets to Christmas! I do a lot of my shopping online so that I don't have to go into the crazy crowds. :) Hope you had a great holiday! Happy 70th to our dad! It seems like it's been a hectic month so far, but busy can be good. Thank you for your birthday wishes! Yes, busy can be good. :) Hope you had a wonderful holiday! Sounds like you all had many fun activities. Also, happy birthday to your dad. Yes, lot of fun activities. Thank you for your birthday wishes!